I have spent over 18 years as a financial executive for many businesses in different industries. Many of the businesses were started by an entrepreneur who saw an unfulfilled need or a need that was being fulfilled with sub-par service. The energy, dedication and enthusiasm of these business owners was contagious. During beautiful nature hikes with my wife in the North Georgia Mountains, I would daydream about starting a company focused on bringing value to its customers, employees and community. Climbing to the top of a mountain and enjoying the 360° views from the top would energize my soul as to the power and beauty of nature. I would sometimes think of the mountain as a company with the start of each hike as the beginning of a company. As we walked, I would envision the growth of the business to its maturity and success at the top of the mountain. Each step added strength physically and mentally to the well-being of the person (the “business”). During these beautiful hikes the one species of flower that I could identify was a Trillium with its brightly colored three petal blooms standing out among the carpet of green foliage. It became a standing commentary that every unidentified flower on our hikes would be labeled a Trillium. Also during these hikes my wife and I had dreams of a family and the joys of being blessed with children. We decided to wait, thinking that our maturity and wisdom would compensate for any lack of physical energy as older parents. On August 21, 2000, my wife and I were blessed by the birth of our three beautiful daughters. 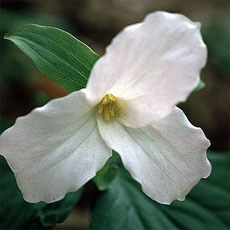 It has been quoted that there is a universal power from the number “three” and we have been touched by the beauty of a three-petal flower (the Trillium) and the birth of three blessed daughters in the millennium. Destiny, coincidence or whatever you may call it; Trillium Financial was meant to be “born” from the dreams of a person blessed by the power of three (oh, and by the way, we found out that we were having three children on the 3rd day of the 3rd month of the 3rd millennium!). THE END of this story but the beginning of an exciting new business adventure! Our company wishes you, your business and your family the best of success in everything you do. Michael Iverson, CPA, CEO Trillium Financial, Inc.